The Karl G. Jansky Very Large Array (VLA) is one of the world's premier astronomical radio observatories, active 24 hours per day. Visit the VLA on the Plains of San Agustin fifty miles west of Socorro, between the towns of Magdalena and Datil, in New Mexico, USA. US Route 60 passes through the scientific complex, which welcomes visitors. The VLA is a set of 27 movable radio antennas on tracks in a Y-shape. Each antenna is 25 meters (82 feet) in diameter. The data from the antennas is combined electronically to give the resolution of an antenna 36km (22 miles) across, with the sensitivity of a dish 130 meters (422 feet) in diameter. After being built 1973-1980, the VLA’s electronics and software were significantly upgraded from 2001-2012 by at least an order of magnitude in both sensitivity and radio-frequency coverage. The VLA is a component of the National Radio Astronomy Observatory (NRAO). Astronomers using the VLA have made key observations of black holes and protoplanetary disks around young stars, discovered magnetic filaments and traced complex gas motions at the Milky Way's center, probed the Universe's cosmological parameters, and provided new knowledge about interstellar radio emission. 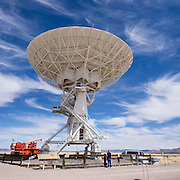 The VLA was prominently featured in the 1997 film "Contact," a classic science fiction drama film adapted from the Carl Sagan novel, with Jodie Foster portraying the film's protagonist, Dr. Eleanor "Ellie" Arroway, a SETI scientist who finds strong evidence of extraterrestrial life.